2. Slice each stick of cold butter into about 8 slices. In the bowl of a food processor add flour, powdered sugar and sliced butter . Pulse until butter pieces are about the size of peas. Pour mixture into prepared baking dish and press into dish evenly. Bake in preheated oven for 18-20 minutes until edges of the crust begin to brown. Set aside and cool. 3. 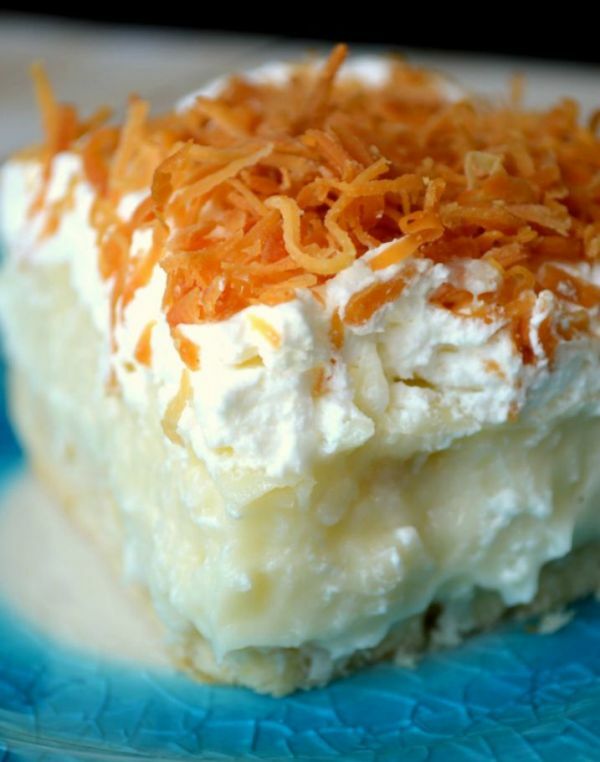 On a rimmed baking sheet, spread 1 cup of the coconut in a thin layer and toast in preheated oven until golden brown. Set aside and use for topping. 4. Make the Filling: In a large sauce pan over medium, to medium-low heat, add half and half, coconut milk, eggs, sugar, cornstarch and salt, cook stirring constantly until mixture begins to bubble and becomes nice and thick. Stir in both the coconut and vanilla extract and the cocout. Pour cooked filling over crust. Allow to cool about 1/2 hour at room temperature then refrigerate for at least 4 hours.